There is a lot riding on the LISA Pathfinder mission, an ambitious effort to test whether intricate technology designed to detect ripples in space-time can be deployed in space. Scheduled to launch on 2 December, the spacecraft is a long-awaited test-drive for a future €1-billion (US$1.1-billion) space observatory planned by the European Space Agency (ESA). The follow-up mission would track the largest objects in the Universe, including mergers between supermassive black holes and collisions between galaxies, by the space-time ripples that they create. The final space-based observatory will try to spot the stretching and compressing of space by bouncing laser beams between three masses floating in freefall, each separated from the others by some 5 million kilometres. Because the masses would be protected from all other external forces, only a gravitational wave should disrupt the synchrony of their falling motion — a disturbance that would affect laser frequency. The LISA Pathfinder (named after the Laser Interferometer Space Antenna, the concept behind the gravitational-wave observatory) is a smaller-scale test of this ultimate plan. With a pricetag of €400 million, it uses just two masses — each a 2-kilogram cube of gold and platinum — separated by a mere 38 centimetres, which allows them to fit inside the same spacecraft. From the time of Pathfinder’s launch from ESA’s spaceport in Kourou, French Guiana, to the end of its subsequent eight-week journey, the masses will stay pinned to their housing deep inside the craft. 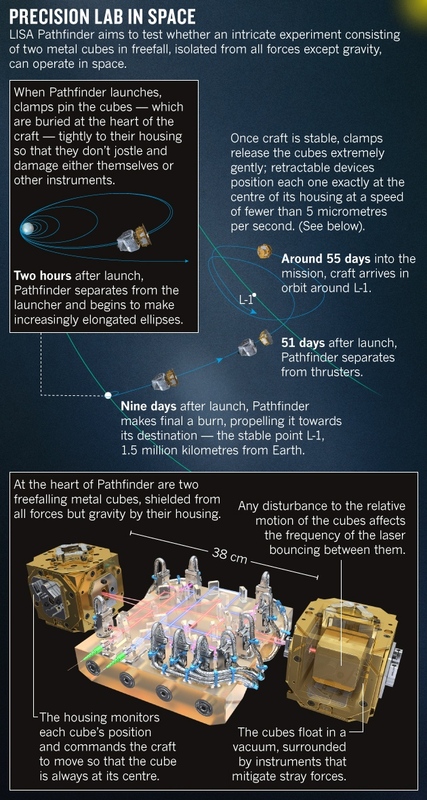 But on arrival in orbit around a stable point between the Sun and Earth called Lagrange point 1, or L-1, about 1.5 million kilometres away, the cubes will be gently released to float within the spacecraft (see ‘Precision lab in space’). Once in freefall, “the challenge is to isolate this little cube from everything around it, so the only thing it sees is space-time”, says McNamara. Expected disturbances are pressure from solar radiation and stray magnetic fields; the equipment is so precise that it should detect even a force equal to the weight of a small bacterium on Earth. As a high-precision laboratory in space, the LISA Pathfinder is unlike anything that ESA has done before, says Tim Sumner, an astrophysicist at Imperial College London who led the team that constructed one of the craft’s protection mechanisms. Another unusual element is that the major cargo — the cubes — will define the craft’s trajectory, rather than vice versa. As they orbit around L-1 and fall in microgravity, Pathfinder will deploy microthrusters that are so gentle, it would take around 1,000 to lift a piece of paper on Earth. The thrusters will monitor the cubes’ positions, ensuring that the craft hovers around the cubes without letting them touch its sides. Such a set-up required the teams who built the instruments and the engineers who made the craft to work together to an unprecedented degree, says Sumner. The final step in the planned mission will test Pathfinder’s limits by instructing onboard instruments to tweak the internal temperature and magnetic and electrostatic fields to see how such changes affect the cubes. “We want to learn everything we can about the physics of a free-floating body, and everything we learn will feed back into design of the future mission,” says McNamara. However, some opportunistic ESA scientists are already thinking about how Pathfinder’s instruments could be used to inform other problems once its main mission, which could take up to a year, is complete. Measurement of the gravitational constant, known as Big G, for example, should fall naturally out of Pathfinder’s data, Sumner says. Because the true value of Big G is disputed, a fresh measurement from space would provide useful perspective. To get a higher precision measurement, ESA may also consider extending the mission — although Sumner says that scientists would only request this after Pathfinder has proved itself, a few months in. He and his colleagues have also discussed using the craft’s thrusters to send it to a spot known as a saddle point, where the gravitational pulls of Earth and the Sun cancel each other out. This could reveal how gravity behaves at its lowest level possible in the Solar System, with little extra cost. Few scientists doubt that Einstein’s theories hold, says Sumner, but it would be interesting to do the test nonetheless.